Gallop through the snow with this 20-inch toy horse! Ready to play and ready to neigh, with or without a sleigh! 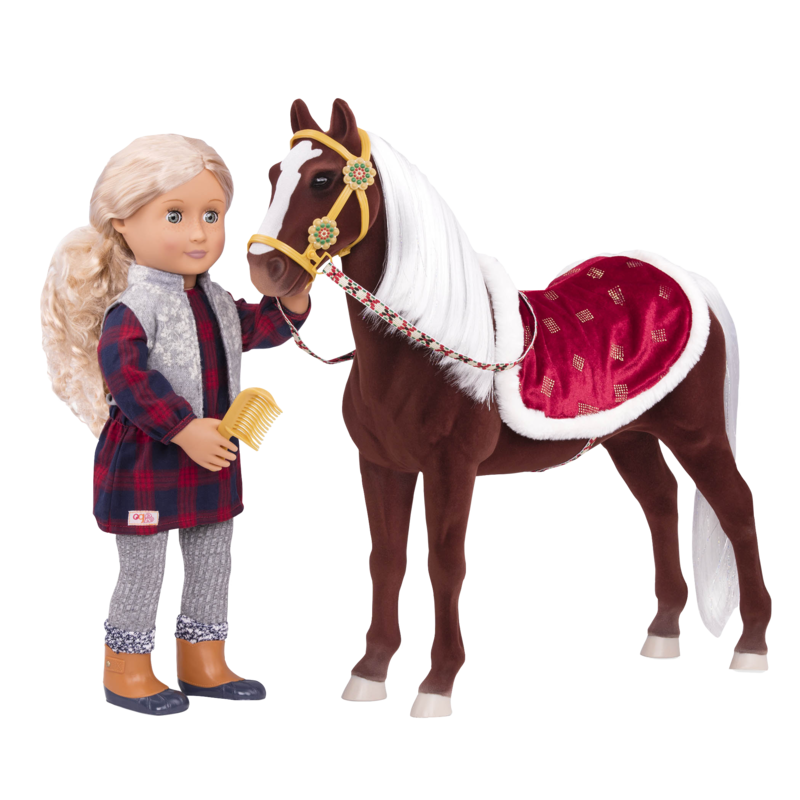 Share the wonder of winter with an equestrian friend this holiday season with the 20-inch Our Generation Winter Wonder Holiday Horse! 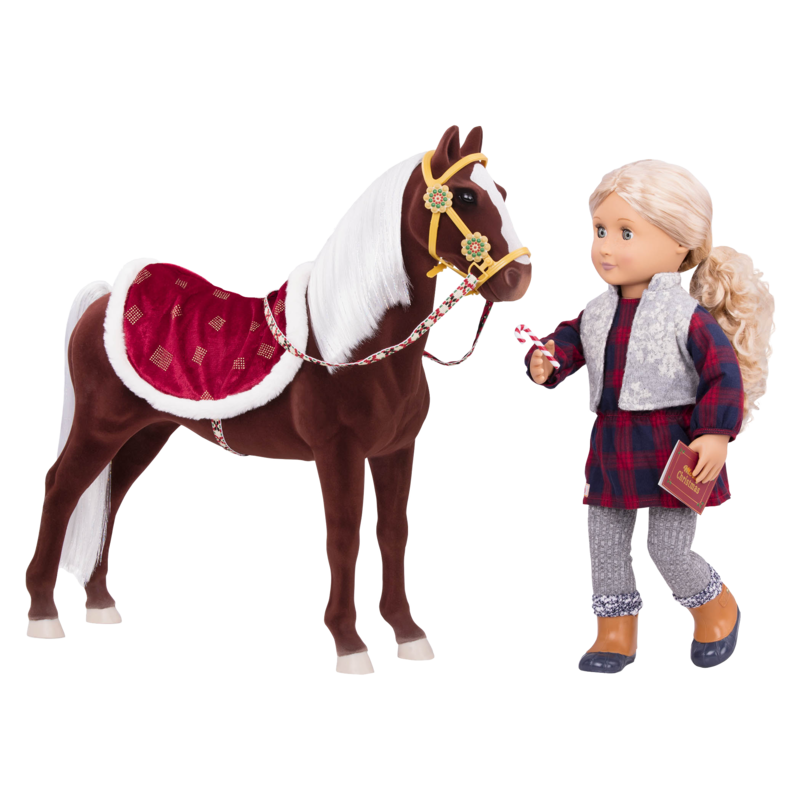 This 20-inch toy horse is the perfect companion for your favorite 18-inch dolls, and is ready to pull their holiday sleigh or just go dashing through the snow! 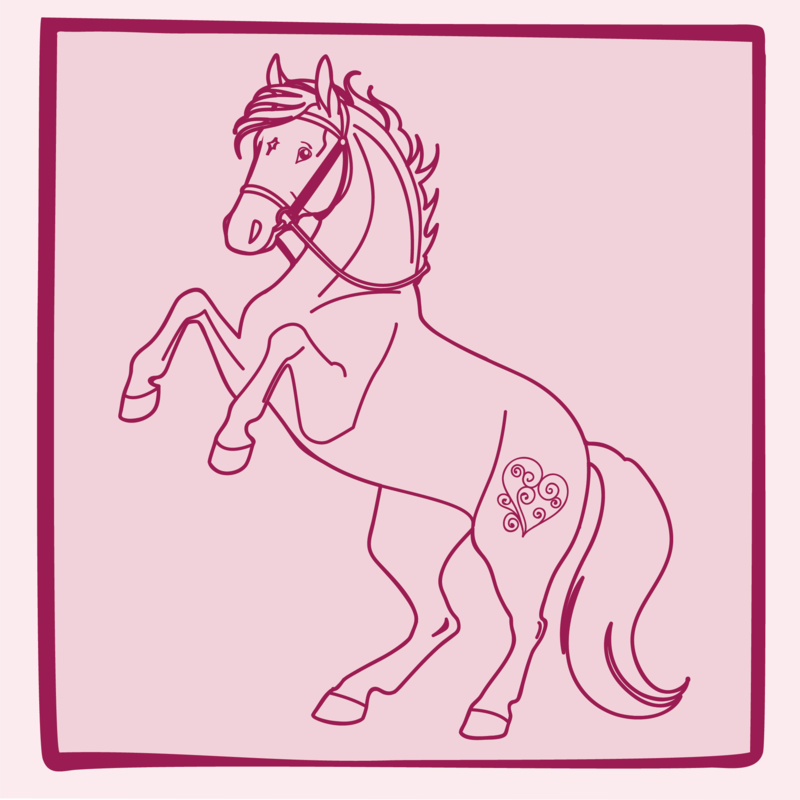 The horse’s body is covered in soft and velvety brown flocking, making it both elegant and cuddly. 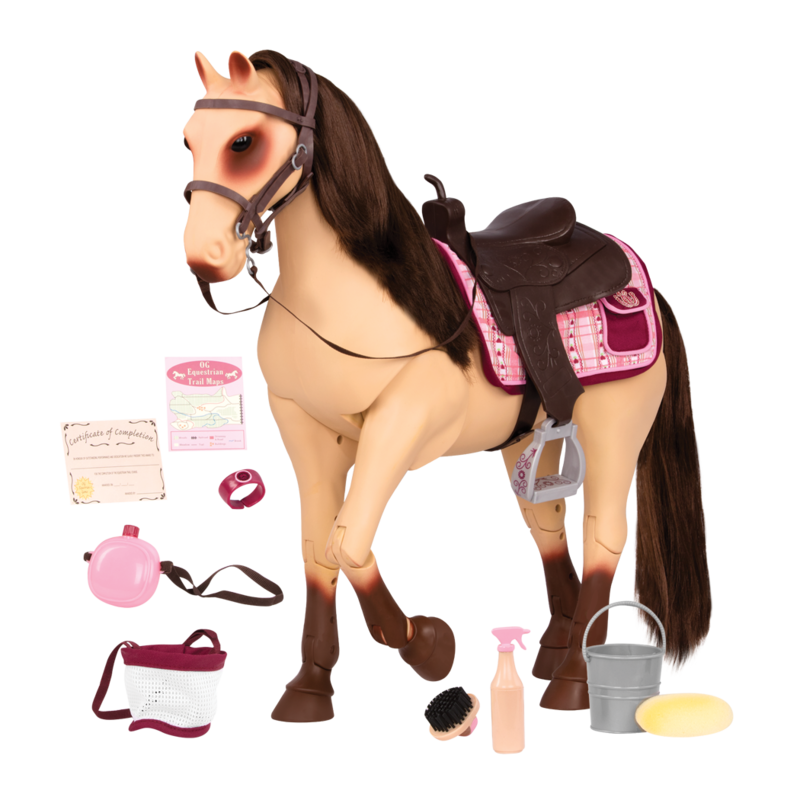 Use the included comb to brush and style the Winter Wonder Holiday Horse’s beautiful, long white mane and tail. 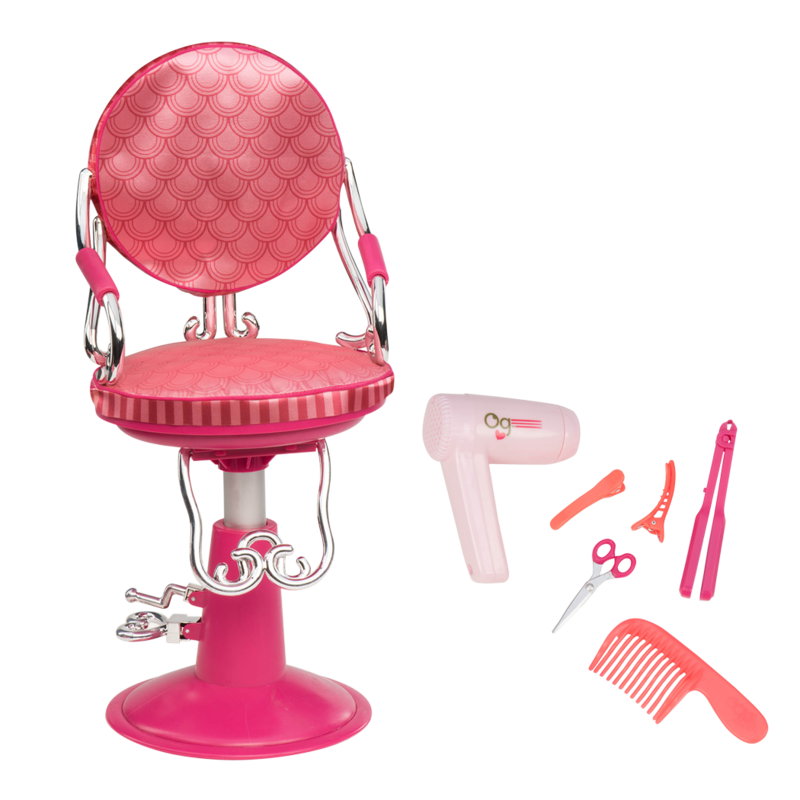 You can even style them for extra holiday glamour! 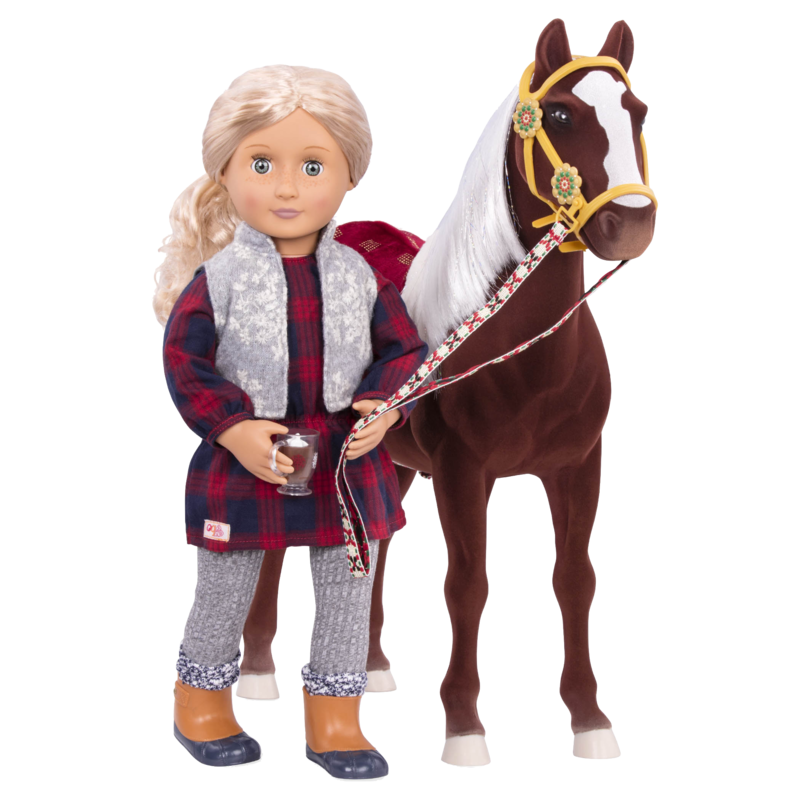 Featuring a bridle with woven holiday-print reins, a red velvet saddle blanket trimmed with white faux-fur, and glittery silver hooves, this beautiful horse is ready to take your dolls riding in a winter wonderland. 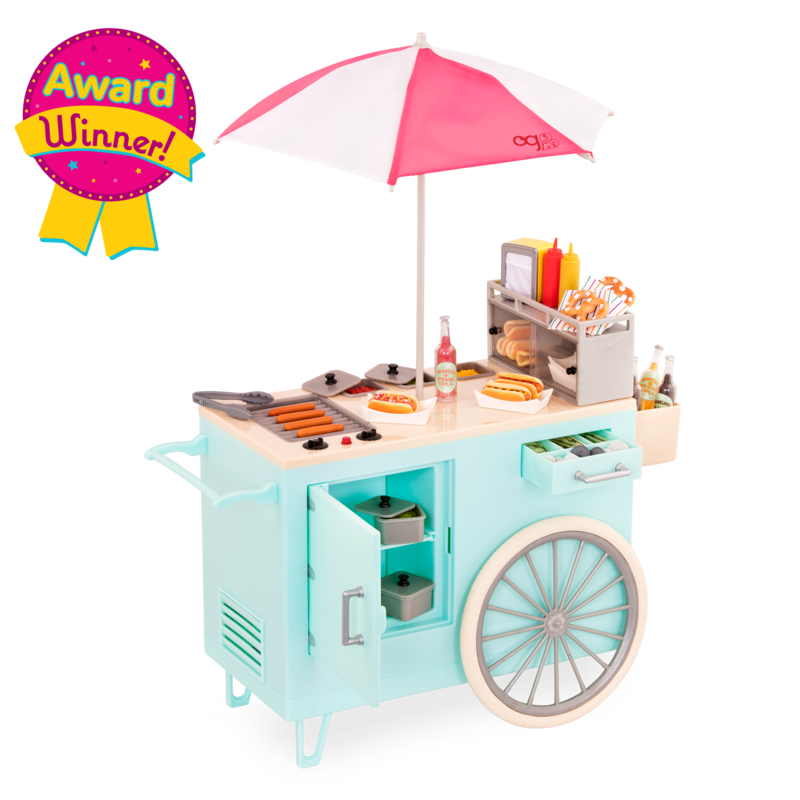 It even comes with winter holiday accessories like candy canes, a greeting card, and a cup of delicious hot chocolate for your doll! 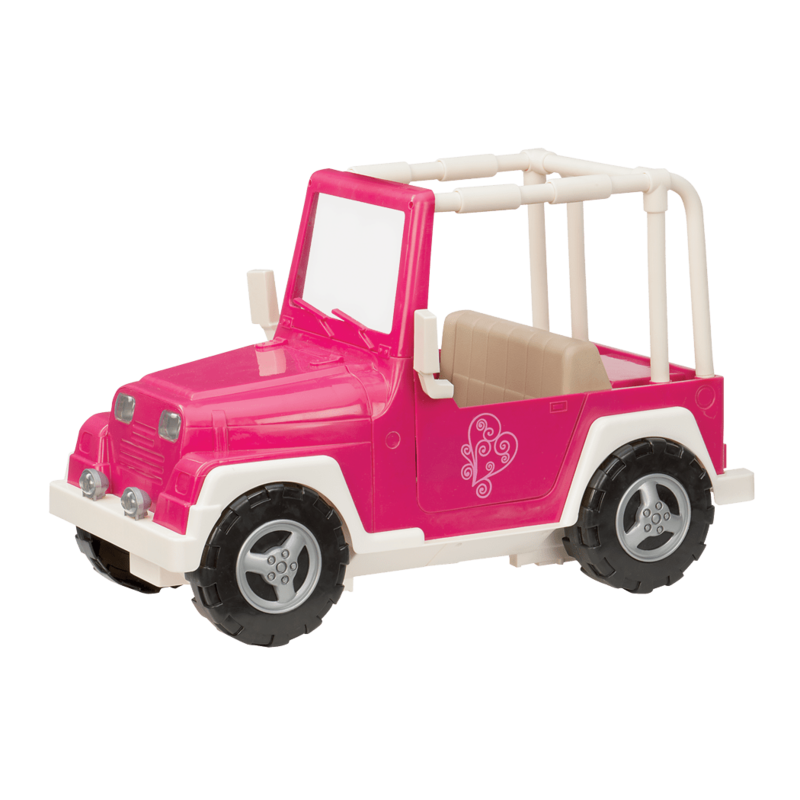 Have you met Coral, the doll in the pictures of the Winter Wonder Holiday Horse? Coral is a beautiful 18-inch doll with long, curly blonde hair and blue eyes. She loves riding the Winter Wonder Holiday Horse all the time, but especially when she is on her way to a holiday party! Horses just love to pull sleighs, and the Winter Wonder Holiday horse is no exception. 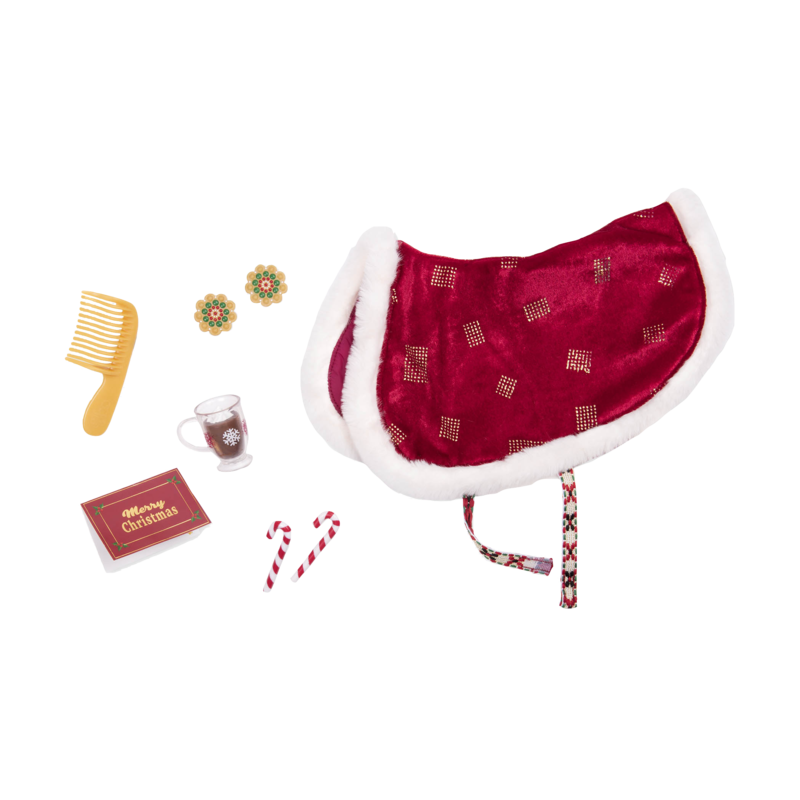 Set up your doll and horse with a “one-horse open sleigh” like the Winter Wonder Sleigh, a beautiful holiday sled with a harness for any of your favorite 20-inch horses to pull it along! 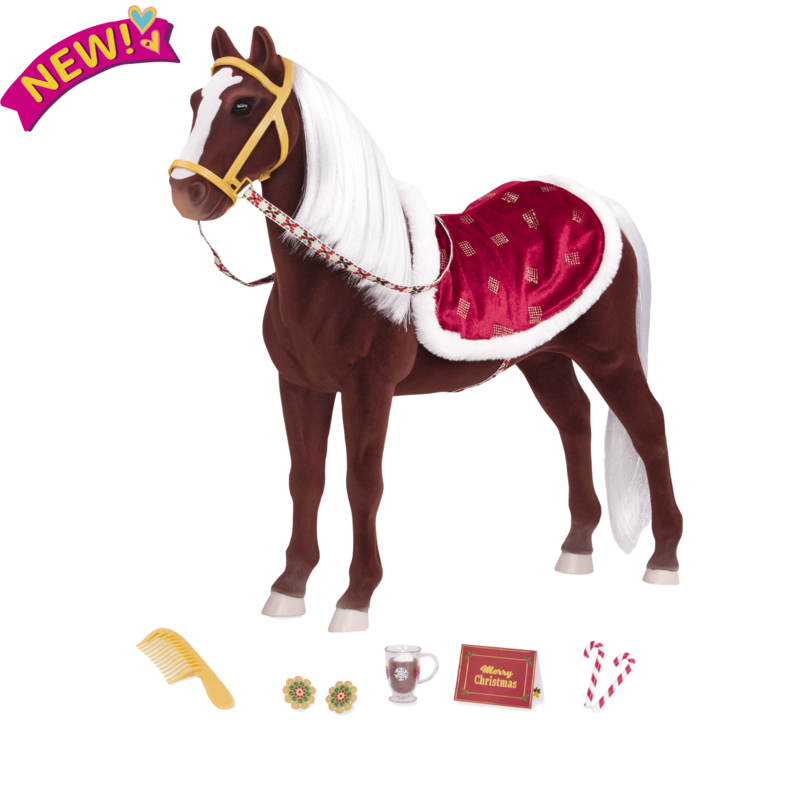 When all the sleigh bells stop ringing, your dolls and horses can relax by the fireplace with the Holiday Celebration Set, a fireplace hung with stockings, a Christmas tree, and presents for your dolls! After all, the holidays are for sharing with the special people in your life, even your dolls!